Morocco offers something for everyone: bustling cities, soaring mountains, beautiful beaches and, of course, the desert. A fabulous fusion of Africa and Arabia, Morocco is a true delight to the senses, where you’ll be enchanted by spice markets and a kaleidoscope of colours. 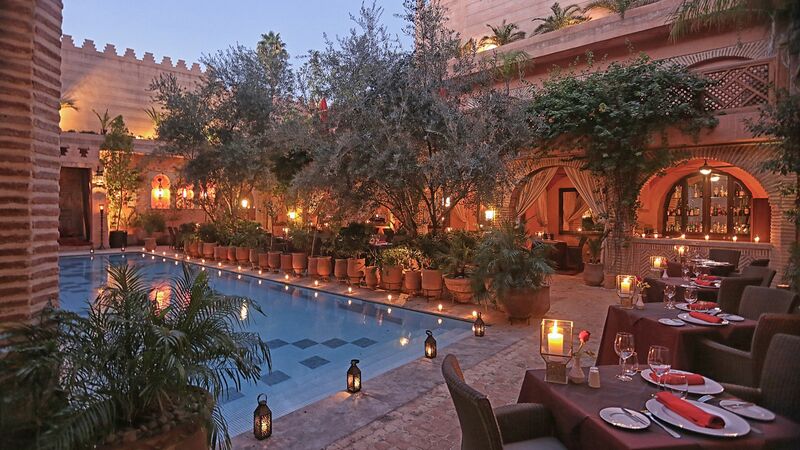 Known as the Red City thanks to its rose-coloured 12th century walls, Marrakech is alive with energy. Its souks are the real draw here: pyramids of spices, snake charmers and colourful carpets all beg to be discovered. There are plenty of opportunities to relax, too, as the city is also home to a variety of picturesque royal gardens. If you’re looking to escape to the beach, Morroco’s top seaside resort, Agadir, boasts a long crescent of golden sand on the Atlantic coast. It’s perfect for golf enthusiasts too, with five pristine golf courses nearby. Or, for a more laid back beach vibe, head to Essaouira, where you’ll find an amazing dining scene and a picturesque fishing harbour. Alternatively, head south to discover the Atlas Mountains - a staggering mountain range which spans across Morocco, Algeria and Tunisia. Here, you’ll find snow capped peaks, awe inspiring valleys and one of the only ski resorts in Africa. Holidays in Morocco promise stunning vistas and exciting medinas, all wrapped up in timeless tradition and contemporary luxury. Indulge in Morocco’s mouth-watering cuisine, such as lamb tangine or zaalouk - a delicious aubergine and tomato dish. Be sure to treat yourself to a Hammam spa or two, a luxurious Arabian treatment which will leave you feeling cleansed and revitalised. Morocco also offers incredible shopping opportunities, with upmarket boutiques and traditional markets selling anything from colourful handmade rugs to fine silverware. 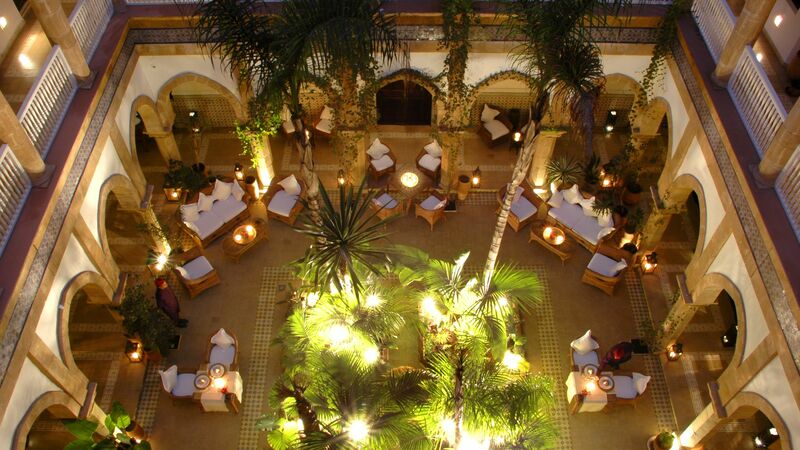 Sovereign offers an exciting range of luxury hotels in Morocco. 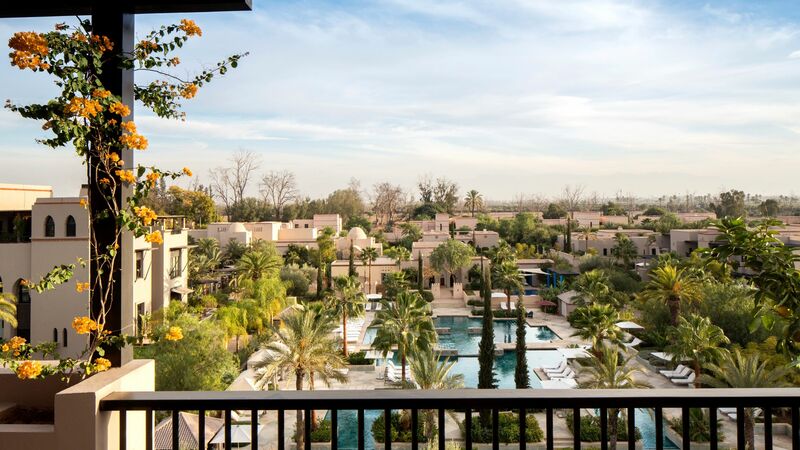 The Four Seasons Marrakech provides an elegant and contemporary retreat, with views of the Atlas Mountains and Menara Gardens. 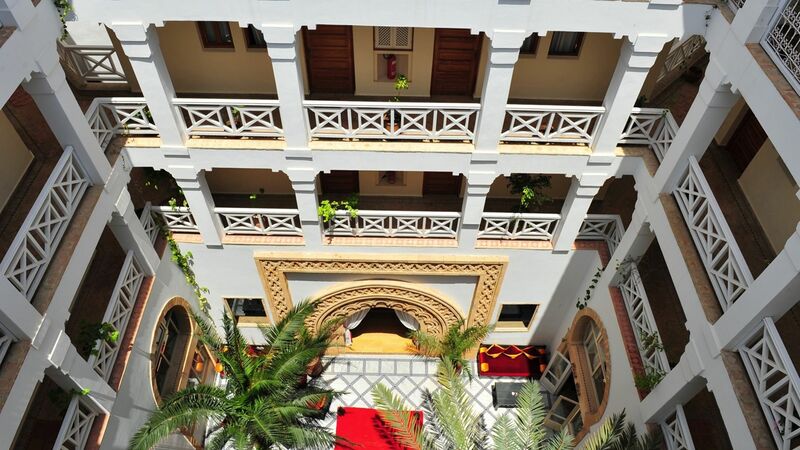 Head to the Heure Bleue Palais in Essaouira to find a luxurious, riad style accommodation with a rooftop terrace offering stunning panoramic views. 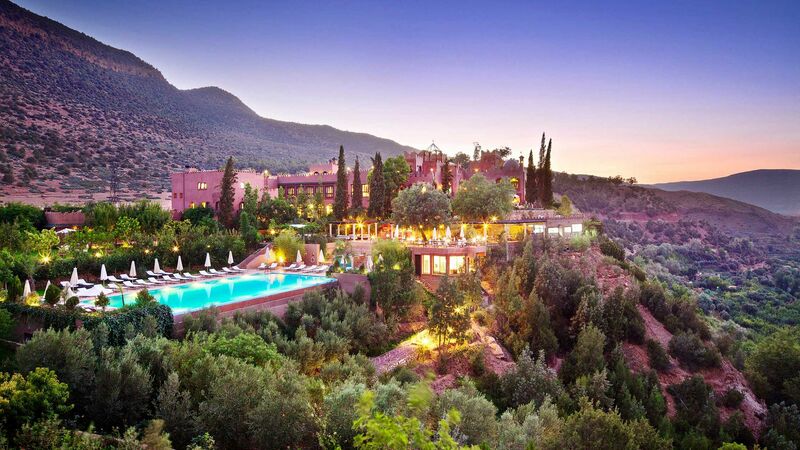 Or, choose to stay in the beautiful Atlas Mountains at Kasbah Tamadot, where you’ll be graced with amazing views across the valleys and can even stay in a traditional Berber tent. Agadir is a modern city that sprawls out along the south-west coast of Morocco, where a sandy bay and golf courses sweep up towards the snow-dusted Atlas Mountains. The Atlas Mountains are a rugged wilderness of soaring peaks and deep-cut valleys. But despite this remote feel, the region is bright with character-packed Berber villages and boutique hotels. Marrakech is a rose-tinted city in central Morocco. It’s an irresistible mix of rich imagery – expect mosaicked mosques, royal orange orchards, smoky souks, riad restaurants and timeworn backstreets. Essaouira is Morocco’s chilled-out beach resort. You can expect a breezy beach, a relaxed medina and a vibrant fishing harbour. This Moroccan itinerary packs in all the best bits of this fascinating country, from traditional cooking classes and wine tasting, to palace visits and authentic market shopping. 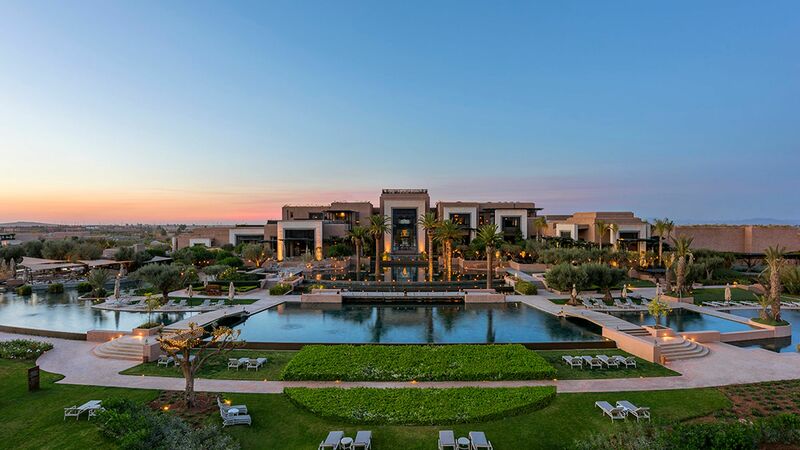 Combining bustling Marrakech, the seaside resort of Essaouria and a desert experience under the stars, this trip brings alive Morocco’s past and present. Make the most of this vast country with a selection of pre-bookable excursions. Essaouira’s surrounding countryside has a forest full of native argan trees and places to watch the production of the famous argan oil. The snow-tipped Atlas Mountains offer the chance to trace local Berber traditions in quaint villages, and Marrakech itself is full of hidden gems waiting to be explored. Speak to one of our Trusted Advisers today for more information. The Moroccan landscape is a rich tapestry of untouched desert, traditional villages, and vast mountains and gorges. Soar high above the north region of Morocco with an unforgettable hot air balloon experience. Watch the sunrise as you hover over this incredible land, and be ready for those breath-taking moments. A hot air balloon experience is truly the best way to enjoy these soul-stirring landscapes. Marrakech has the biggest pick of markets. Handmade clothes include silk skirts and tailored shirts, and you’ll be tripping over leather satchels and handbags. Meanwhile, Argan oil is plentiful – and cheap – in Agadir. You can use the nutty oil as a miracle hair tonic or drizzle it over desserts. Spices and tea also perfume the souks, while nuts and dates make great take-away treats. You can match them with bright hand-painted bowls or an intricately decorated silver tea tray. Morocco is around 3 hours 30 minutes from the UK. There are no two ways about it: Morocco is a scorcher. Summers can get up to 40°C in July and August, although in coastal areas like Agadir, you’ve got the sea breeze taking the edge off. The heat is more tolerable in spring and autumn, when averages hover in the mid-20s. Remember to pack a jacket, though – things can cool down rapidly once the sun goes down. Visas are not required for UK citizens travelling to Morocco. There are no specific rules for tipping in Morocco. An upmarket restaurant may add on a service charge, so check your bill carefully. Otherwise, aim to leave around 10%. In taxis, it’s acceptable to just round up the fare. It’s a good idea to have some small change on you for paying taxis and tipping guides. The official language of Morocco is Arabic. English is widely spoken too, so getting by is easy. With Arabic, West African and Mediterranean influences, Morocco’s distinctive cuisine is popular far beyond its borders. Herbs and spices are used extensively, as well as an abundance of olives, oranges and lemons. The best-known local dishes include tagine: a slow-cooked stew traditionally made from lamb, olives and tomatoes, plus dried fruit and herbs. Cous cous is another favourite; it's a staple of Moroccan and North African cooking. The drinking and preparing of tea is an art form in Morocco. Maghrebi mint tea (green tea mixed with mint leaves and sweetened with sugar) is served to guests as a sign of hospitality, and it is considered impolite to refuse it. What power plugs and sockets are used in Morocco? Morocco uses the same type of power plugs often seen on the continent, the two round pins of Type C, and also type E, which is almost the same but for an extra pin on the socket. The voltage is 220V, and the frequency 50 Hz. Can you drink alcohol in Morocco? Drinking alcohol is forbidden in Islam, but the situation is a little different in tourist hotspots. Resorts, restaurants and larger stores all stock and serve alcohol.